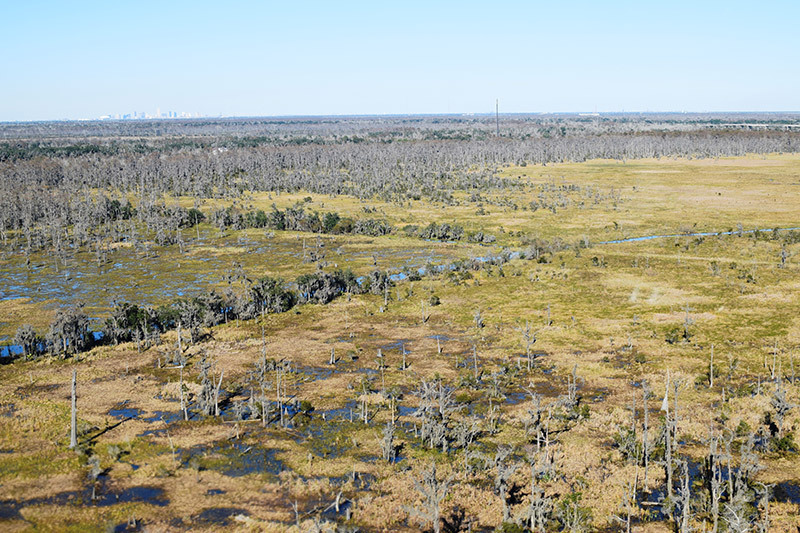 The Trust for Public Land worked with local, state, and federal partners to conserve the 3,455-acre Fleming Plantation as an addition to the Jean Lafitte National Historical Park and Preserve's 23,000-acre Barataria Preserve. Located just 15 miles south of New Orleans, Fleming Plantation was the largest remaining privately owned tract inside the acquisition boundary of the Barataria Preserve, a key public land component of Louisiana’s Barataria Basin. The basin is a biological hotspot, providing forest, marsh, and aquatic habitat for a variety of migratory birds, important fisheries, and other wetland dependent wildlife. However, rapid coastal erosion and subsidence in the lower basin rank it among the world’s highest rates of wetland loss. The acquisition of Fleming Plantation will build upon an existing network of conserved lands spanning more than 56,000 acres in the Mid-Barataria Basin, and will be complemented by extensive ecological restoration in the area completed in recent years or forthcoming in the near future. As part of the Barataria Preserve, the property will be provide the public near and far an opportunity to enjoy the property’s lush wetlands for hiking, boating, wildlife viewing, fishing, and hunting. At less than 15 miles from downtown New Orleans, the site should have many visitors. In addition to recreational benefits, wetlands such as those conserved at Fleming Plantation buffer higher elevation sites from storm surge from tropical storms and hurricanes. The city of New Orleans and small towns and communities across coastal Louisiana are particularly at risk from storm surge events. Conserving the Fleming Plantation wetlands will directly buffer the adjacent town of Jean Lafitte and the larger New Orleans metro area from storm surge events. Funding for the project was provided by two North American Wetland Conservation Act grants, a grant from the National Fish and Wildlife’s Acres for America program, and private donors. Additionally, the Partnership for Gulf Coast Land Conservation contributed toward due diligence expenses.